I just wanted to get the word out that we will be posting positions very soon for either an Internship or an AmeriCorps member for Participatory Budgeting Greensboro. This person will assist in volunteer management and outreach to ensure broad participation and engagement in the Participatory Budgeting process. Experience with volunteer management, door to door canvassing and clipboarding, and communicating and relating to diverse communities are all extremely beneficial. We are hoping to fill this position as soon as possible. The AmeriCorps Member position would be a full-time equivalent and would include a monthly stipend and education award at the completion of the program. The internship position would be part time. Please spread the word to anyone you know who might be interested and refer any questions to me at valerie@participatorybudgeting.org. Thank you! Please share widely! 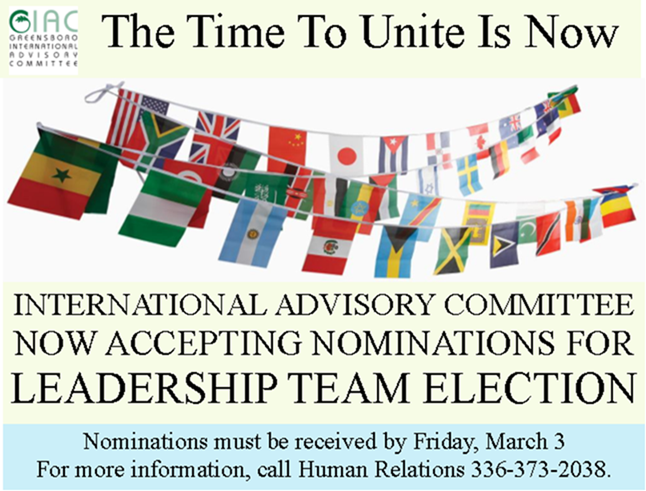 The deadline to submit nomination forms to serve on the International Advisory Committee has been extended from February 23 to March 3! Find a copy of the nomination form online and learn more about the roles that need to be filled with the IAC, a unique advisory board that was created by City Council. The IAC election will take place on Sunday, March 12 from 9-5 at the Fanta City Event Center (4925 W Market St). For more information, reply to this email or call Human Relations at 336-373-2038. Please join us for a Continuing Legal Education program on the legal fight to eliminate housing discrimination against the LGBTQ Community on Friday, February 24, 2017, at the Elon University School of Law in Greensboro, NC. Early bird rate: Register before January 27, 2017, for $65. The program is sponsored by the Fair Housing Project of Legal Aid of North Carolina; North Carolina Justice Center; Equality NC; LGBTQ Center of Durham; OUTLAW Elon Law School Chapter; Greensboro Human Relations Department; North Carolina Human Relations Commission; Orange County Department of Housing, Human Rights & Community Development; Winston-Salem Human Relations Commission; City of Durham Department of Neighborhood Improvement Services, Human Relations Division; Charlotte/Mecklenburg Community Relations Commission; North Carolina Association of Women Attorneys. This Conference is funded in part through a grant under the Fair Housing Initiatives Program with the U.S. Department of Housing and Urban Development (HUD). For more information, or for information on scholarships for low income individuals, please visit http://www.fairhousingnc.org, email info@legalaidnc.org or contact the Fair Housing Project by phone at (919) 277-9020. Below is also a note that can also be included on emails, allowing folks to learn more about the event and register if they want. FYI – Registration is now open for the Fair Housing training in Greensboro on February 24, 2017. This training will focus on the legal fight to prevent housing discrimination against the LGBTQ Community. CLE credits available. Drew University, a selective liberal arts college located 30 miles outside of New York City, seeks applications for a one-year faculty position in Women’s and Gender Studies with a specialization in gender and health and a disciplinary location in the social sciences. Ph.D. required as well as a record of teaching excellence. Courses will include: Introduction to Women’s and Gender Studies; a course on gender and health; as well as a choice of interdisciplinary women’s and gender studies courses, disciplinary courses, or a course in the interdisciplinary public health program. Teaching load is 3/3. Submit cover letter and CV by February 10, 2017 to the following address: HR0117-3@Drew.edu. To enrich education through diversity, Drew University is an Affirmative Action/Equal Opportunity Employer. In accordance with Department of Homeland Security regulations, successful candidate must be authorized to work in the United States. The Duke University Program in Gender, Sexuality & Feminist Studies invites applications for a residential postdoctoral fellow in Transgender Studies for the 2017-2018 year. The Duke University Program in Gender, Sexuality & Feminist Studies invites applications for a residential postdoctoral fellow in Transgender Studies for the 2017-2018 year. Through research, teaching, and service, the fellow will contribute to the overall work of the GSF Program. We seek candidates with interdisciplinary experience in Gender/Women’s/Sexuality Studies, a record of scholarship on transgender, transsexual, or gender-non-conforming subjects, and demonstrable engagement with conversations in Transgender Studies. Scholarly specialization can be empirical, archival, textual, and/0r theoretical. Postdoctoral fellows are expected to design and teach an undergraduate course on transgender studies and to support the integration of transgender studies through a variety of potential activities across the fellowship year (e.g., outreach to student groups, mentoring graduate students, participating on panels). The fellowship includes a stipend, health insurance, and office space. Applicants should have PhD in hand by July 1, 2017 and be no more than five years past the PhD. In addition to your letter of application, please include a 1000 word project proposal (with 1 page bibliography), a C.V., and names and contact information for references. Please submit application electronically by December 1, 2016 through AcademicJobsOnline.org. Please note that finalist will be asked to submit three reference letters, a writing sample, and course proposal. GSF program information is available at http://gendersexualityfeminist.duke.edu/. Duke University is an Affirmative Action/Equal Opportunity Employer committed to providing employment opportunity without regard to an individual’s age, color, disability, genetic information, gender, gender identity, national origin, race, religion, sexual orientation, or veteran status. Duke University is an Affirmative Action/Equal Opportunity Employer committed to providing employment opportunity without regard to an individual’s age, color, disability, genetic information, gender, gender identity, gender expression, national origin, race, religion, sexual orientation, or veteran status. Please submit application electronically by December 1, 2016 through AcademicJobsOnline.org at https://academicjobsonline.org/ajo/jobs/8175. GSF program information is available at http://gendersexualityfeminist.duke.edu/. AAUW advances equity for women and girls through advocacy, education, philanthropy, and research. Their dedicated staff serves a diverse community that breaks through educational and economic barriers so that all women have a fair chance. AAUW currently has several openings for full-time and consultant positions as well as internships. Get more information and apply at http://www.aauw.org/who-we-are/jobs/aauw-jobs-and-internships/.